These Akiles FlexiPunch-M Binding Die Set are designed for use with the Akiles FlexiPunch-M manual binding punch. Akiles produces four different die sets for the FlexiPunch-M binding systems. Choose a die for plastic comb binding, 3:1 pitch wire binding, 2:1 pitch wire binding or 4:1 pitch spiral coil binding. When you buy a new FlexiPunch-M binding machine it will come with one die of your choice. However, you can quickly expand the capabilities of your machine by simply purchasing a new die set. Just remember that you will also need to buy a Plastic Comb Opener to finish your comb bound documents. Welcome to MyBinding video. Let's have a look at the Plastic Comb Binding Set for the FlexiPunch-M by Akiles. Built for use with either the FlexiPunch-M M or E, this punch die snaps right in and locks into place. It's a heavy-duty punch die with plenty of features. It fits right into the FlexiPunch-M system with no problem. Markings on the front die help you to line up your papers with the side margin control knob so that all punches are consistent throughout your project. The die can punch up to 20 sheets of 20-pound paper and work through various types of materials. All the punch pins are fully disengageable on this die so any kind of customization is possible. You can adjust the depth of margin with this control knob on the side for thinner or thicker margins. It's a great investment and will last you a long time. 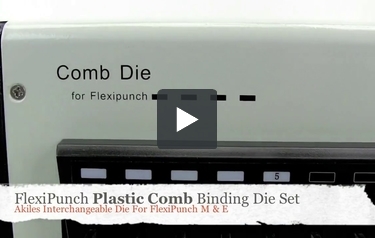 That's the FlexiPunch-M Plastic Comb Binding Set. For more demos, reviews and how-tos, check out MyBinding.com. Welcome to MyBinding video. 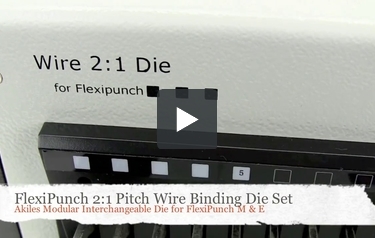 Let's take a look at the FlexiPunch-M 2:1 Pitch Wire Binding Die Set, built for the Akiles FlexiPunch-M M or E model. Slide your punch die right on front of the machine, lock it down with the handle on the left, put your tray table back in place, and you're on your way. There are plenty of measurements on the front of the die face to interact with the side margin control knob so all punches are consistent throughout all your projects. And every punch pin is disengageable on this die. That way, you can use any size paper you want. There's also a four-stage depth of margin control knob on the side that allows you to use thin or thicker margins, depending on the size project you'll be making. And this FlexPunch Die Set can handle up to 20 sheets of 20-pound paper in a single punch. That's the Akiles FlexiPunch-M 2:1 Wire Binding Set. For more demos, reviews and how-tos, check out MyBinding.com. Welcome to MyBinding video. 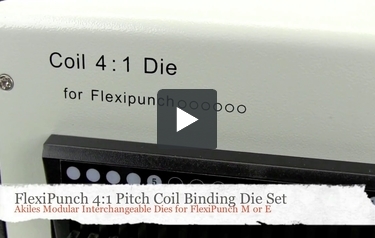 This is the FlexiPunch-M 4:1 Pitch Coil Binding Die Set for the FlexiPunch-M. This heavy-duty die is built for precision and long-lasting life. It snaps right into the front of your FlexiPunch-M E or M, locks down into place, set up the tray, and you're on your way. Since your workload is dependent upon this punch, it's filled with features. The die has markings on the front side of it so that when you line up at the side marks control, all your punches are completely consistent throughout your project. The die itself is clean, quiet and has a very precise 4:1 pitch pattern for coil binding. Every punch pin is fully disengageable so you can work with any size piece of paper you need. The depth of margin control knob on the side allows you to pick between thinner or thicker margins according to your project's needs. And this die can handle up to 20 sheets of 20-pound paper in a single punch. And there it is. That's the Akiles FlexiPunch-M 4:1 Pitch Coil Binding Die Set. For more demos, reviews and how-tos, check out MyBinding.com.